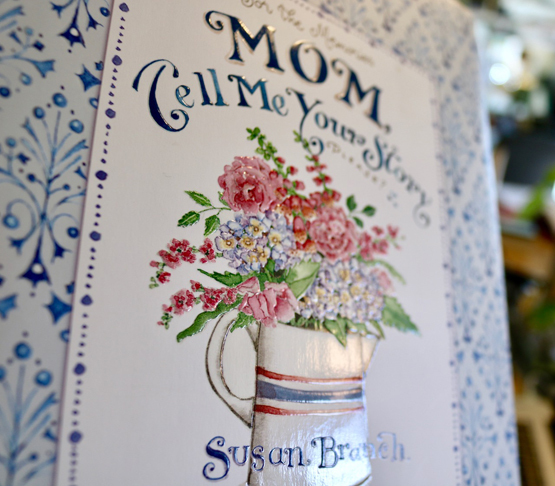 Susan's keepsake book, called "MOM, TELL ME YOUR STORY, Please" is a hardcover guided journal; approx. 8 1/2" x 11"; 124 pages with an embossed cover and a blue satin ribbon marker. The paper is lined, there are seven marked spaces for photos, although you may put in as many as you'd like. It's filled with questions Susan wrote with Mom's in mind, questions about childhood, dreams, clothes, books, love, motherhood...so that when Mom fills it out, there will be a record of all those little things we want to remember most about her. As Susan says, "Memories are made of this." It's a book for your mom, or your grandma-mom, your sister-mom, or your best-friend-mom, or for YOU-mom; tuck in letters, photos, recipes; it's a book that becomes more valuable with time.